The band is Tuba Skinny, but the tuba player is Todd Burdick. Photo by Jean Hangarter. Okay, the weather in Somerville is finally catching up with what it was in New Orleans two weeks ago. 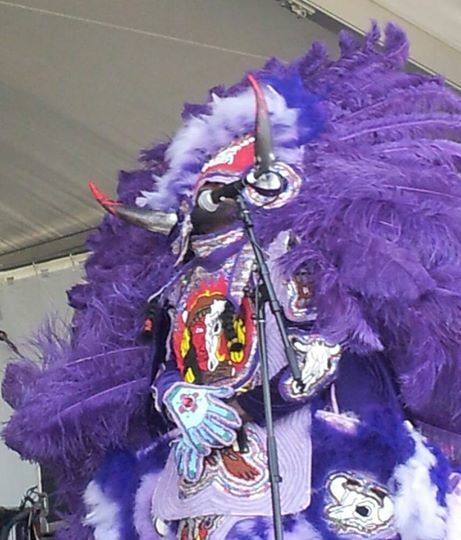 But I still want to hang on to those memories of New Orleans and the 44th annual Jazz & Heritage Festival, especially of bands we were discovering for the first time. The first was Natalie Mae and Her Unturned Tricks. Since the Fest is held at the Fair Grounds Race Course and Ms. Mae and her crew were performing in the paddock area (on the Lagniappe Stage), let’s call this a name bet. It was also one of the best places to seek shelter in the first of Sunday’s several downpours. She came out and sang a country-gospel tune — high and lonesome with plenty of Appalachia twang, accompanied by just banjo and bodhran. Then she said, “We’ve got some Unturned Tricks coming up for you now.” That would be: tenor sax, trombone, trumpet, guitar, fiddle, female backup singer, keyboards, bass, drums. In short order they moved through a country two-step, country-swing, rockabilly, a John Hiatt cover, and all-out rock and roll. The variety of the arrangements, the playing (especially Michael Lentz’s big, resonant hollow-bodied Gibson), and Mae’s original songwriting all grabbed me. And that voice. By the time she’d turned the corner for the out-chorus of her own rockabilly “Something to Me” and poured on the gas, she’d left the mountains for the big city. We’re bludgeoned with cooking shows these days, but I have to admit that some of the most moving performances I’ve seen at Jazz Fest have been at the Food Heritage Stage in the grandstand. I’ll never forget one of my first Fests, where neighborhood chef James Batiste told the story of his life as he made oyster pie. On top of the insider chef confessions (“I can make pie crust — I just can’t make a pie crust that I like”) was the epic story (replete with Oedipal struggle) of the journey to owning his own restaurant. Then it was back into the paddock to catch the end of Tuba Skinny’s set. 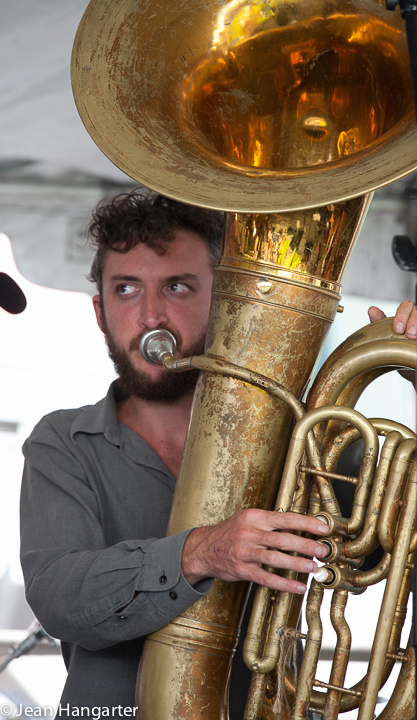 Tuba Skinny, though the name is adapted from the late Anthony “Tuba Fats” Lacen, is not a person, but a band. Formed in 2009, they were first recommended to me by my friend Daisy Novoa after one of her visits to Nola, but this was my first hearing of them. Despite the name, they were no joke. Looking funky and twentysometing, they played a serious selection of rags, early jazz, Depression-era ditties, and blues, arranged with sharp instrumentation and idiomatic solo breaks. The reed players mixed up alto and tenor with clarinet, and there was also banjo, tuba, trombone, washboard, and a singer who played bass drum. But maybe most impressive was Shaye Cohn on cornet. Every break she took rang with exuberance and authority, and she seems to play a leadership role — counting off the tunes, calling the breaks, and even writing an original tune on one of the CDs we bought from the band. She also seems to the manner born: granddaughter of saxophone great Al Cohen, and daughter of distinguished guitarist Joe Cohn. As the rain cleared for a minute, there was pianist Ed Volker, formerly of the Radiators, playing acoustic piano accompanied by baritone sax and drums, and singing radically re-arranged versions of “Subterranean Homesick Blues,” “Jumpin’ Jack Flash,” “House of the Rising Sun,” and “Big Chief,” often slowed way down and sometimes with new lyrics (“Don’t follow leaders/watch the Funky Meters”). What haven’t I mentioned from that weekend? A DJ trio of Native Americans (from Ottawa) tearing it up and getting the crowd screaming with their “pow wow step.” Eddie Palmieri’s Salsa Orchestra floating on one of his deathless son-montuno grooves. Joshua Redman admitting from the stage of the Jazz Tent that although this was one of the few jazz events that his family wanted to join him for, they were probably “out there looking for food” rather than watching him play. This entry was posted in Live review and tagged Eddie Palmieri, Herbsaint, House of Dance and Feathers, jazz, Natalie Mae, New Orleans Jazz & Heritage Festival, Ronald W. Lewis, Shamarr Allen, Tuba Skinny on May 10, 2013 by jongarelick.